Flight delayed passengers can claim compensation for delays caused by lightning strikes as a result of a judgement at Reading Crown Court. Her Honour Judge Melissa Clarke ruled in favour of passengers Michael Evans and Julie Lee today (14/01/16) in the appeal case of Evans v Monarch Airlines Ltd at Reading County Court. The Judge awarded the passengers €600 (£450) each for a five-hour flight delay. The judge ruled that lightning strikes are not one of the ‘extraordinary circumstances’ that excuse airlines from paying flight delay compensation. Although the decision is not legally binding on other courts, it follows an appeal hearing at Luton County Court (where a large amount of flight delay cases are heard) and is the lead case on the issue of lightning strikes. As such the decision will be highly persuasive in flight delay cases involving lightning in English and Welsh courts. European Flight Delay Regulation EC 261/2004 says that passengers delayed by three hours or more in the last six years may be able to claim up to €600 compensation, as long as the delay was not caused by extraordinary circumstances. But the Regulation does not provide a specific list of extraordinary circumstances, leading to long court battles between airlines and delayed passengers. Bott & Co Solicitors, who acted on behalf of Michael Evans say the ruling could benefit 54,000 delayed passengers across the different airlines, totalling £17.6million in flight delay compensation. 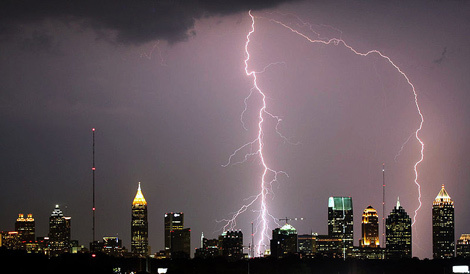 Although the vast majority of aircrafts that are struck by lightning arrive safely and on time, delays occur when the plane lands and is subject to mandatory safety checks and the airline does not have relief aircraft in place to ensure passengers on any subsequent flights are not delayed. In this case Monarch did not have spare aircraft available so passengers had to wait for the plane that had been struck by lightning to go through safety procedures in Gatwick. Bott & Co Solicitors successfully argued that lightning strikes cannot be considered extraordinary because they are part of the day to day running of any airline. The Civil Aviation Authority includes lightning strikes in its list of extraordinary circumstances but as Judge Clarke said in today’s ruling, the list is not legally binding and has been proven wrong in court a number of times. For more information about your rights under regulation EU261, see this article by aviation lawyer, journalist and travel writer Alexander Freeman.